Our great friends over at Hang Dai Studios will be joining us for a fantastic signing event with Dean Haspiel (The Fox, American Splendor), Christa Cassano (The Giant Effect) and Josh Neufeld (The Vagabonds). 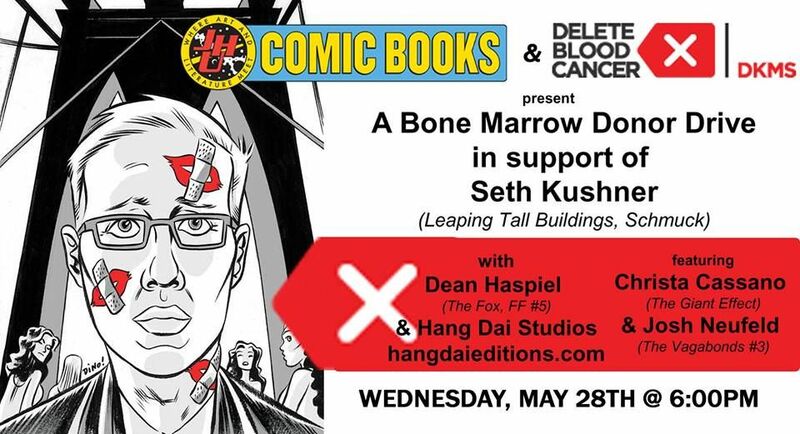 Along with celebrating Dean Haspiel's art in FF #5, which hits the same day, it is also World Blood Cancer Day. Seth Kushner (SCHMUCK, Leaping Tall Buildings), a great comic writer, photographer and artist, and friend Dean and us at JHU, has been diagnosed with Leukemia. As he awaits a marrow donor, we thought it would be a perfect time to host a bone marrow drive. Delete Blood Cancer is going to be here, swabbing and informing folks on how being a donor works. (More on that below!) Even if we don't find a match for Seth at our event, there are millions of others that could use your help and you as their match! Come out, get some comics, meet some great people and help out in the name of one of our great, talented friends! We want to make sure that helping a patient get healthy won’t impact your health. Please review the following list of conditions. If you’re not sure about a condition, feel free to call us: 212-209-6700.